Update: Thanks for checking this out! However, since Google created and now maintains an updated version of a data feed explorer, we have take the Vasco De Gapi application offline. Are you ready to explore the Google Analytics API? At Juice, we were very excited about the public release of the Google Analytics Data Export API. Our product Concentrate has been running on a hackish home-brew Google Analytics export tool since its release last November, and we were happy to be able to relaunch as a Customer Example of the Google Analytics Data Export API. Today, we are releasing a new, free tool called Vasco de GAPI. Vasco is a web-based tool for exploring the API, for downloading complex slices of data using the API, and to even automatically generate code that will allow coders easy replication of the API calls in question. Instead of describing it in more detail, I am just going to demo it. I am going to start with a relatively rare but curious functionality of Google Analytics. I keep track of who wrote each blog using a Google Analytics user-defined setting that is set to the author’s name for each specific blog post. Slicing our blog by author can be cool for me as an employee so that I can brag during my yearly review about how many visitors I bring in or what natural search visits we get for free as a result of my posting. For the demo, I’m going to discover the natural keywords that bring traffic to my blogposts on the website. The first step is to authenticate using Google’s OAuth system. I select ga:keyword as a dimension. ga:pageviews is the metric I am interested in. The results will automatically get sorted by the first metric, so I do not need to explicitly specify a sort value. I set ga:userDefinedValue as a filter, and filter it to saluryasev, and select this last week as a reference point. 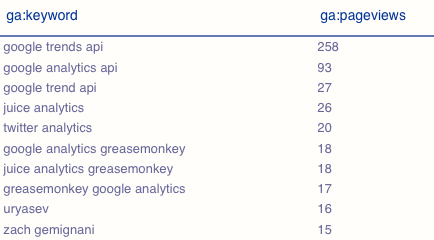 Here is the list of parameters that Vasco de GAPI is passing to google. It turns out that of all my posts, the Google Trends API that I put out about a year ago drives the most natural traffic to our site. Hopefully, this will change with a few more blog posts, but this is still rather interesting data. I could target that specific audience with something Google-trendy. On an unrelated note, a slap to my face was that Zach’s name sent fifteen users to my blogposts. Go figure. Sixteen users searched on my last name, and were probably looking for my more popular father. To get at the rest of the data, I can click the download link at the bottom of the page or, for developers, another link downloads working code that will replicate this exact pull. Vasco runs using an open source Python gdata wrapper for the API that can be downloaded here. This wrapper is powerful, and I will write another blogpost about it next week. It is plugged into the Google gdata module, and as such allows all forms of authentication available to gdata users, including OAuth, AuthSub, and clientside. Hopefully, Vasco de GAPI can help all other potential explorers sail smoothly through the API. When it comes to data, Google is just an great company. They have had powerful APIs for most of their major services for years, and while the Analytics API is a latecomer, it actually is more powerful than the analytics interface itself. This sort of openness is something to be envied by all other analytics and web companies in the market. By the way, please let me know if the explorer theme works well. It was a lot of fun working on a project with a slightly esoteric approach.